I have been fortunate to be able to travel frequently as a travel writer and I love seeing cats in all the places I visit. One of the most memorable places so far has been my visit to The Ernest Hemingway Home and Museum in Key West. In fact, the only place I definitely wanted to visit on my trip to the Florida Keys was the Hemingway Home. 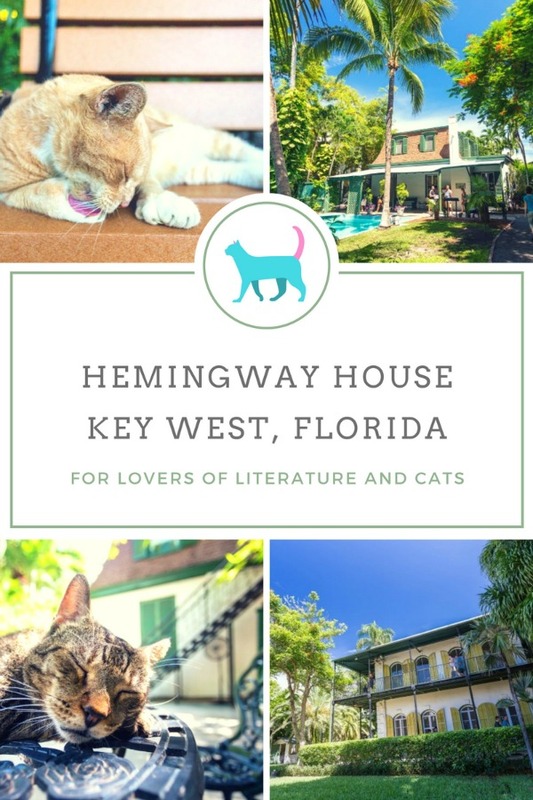 Partially because I enjoy Hemingway’s work but mainly because the property is home to about 45 cats! 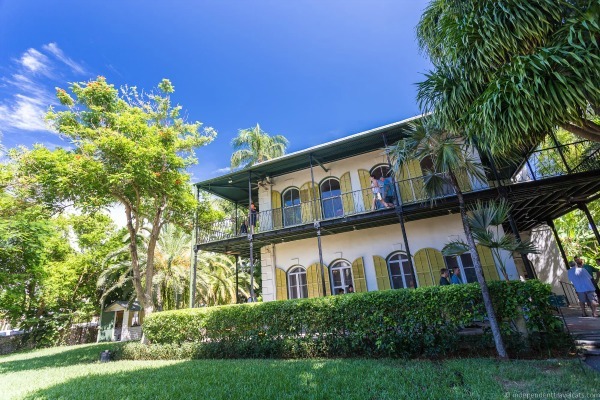 The Spanish Colonial home was Hemingway’s home in the 1930’s and 1940’s and has since been made into a museum. We were able to take an interesting guided tour of the inside of the house and Hemingway’s studio, and then explore the gardens on our own. Throughout the house and gardens, you’ll find cats perched here and there. During our tour, one of the cats followed the guide around and jumped around on the furniture and another was sleeping on one of the beds. 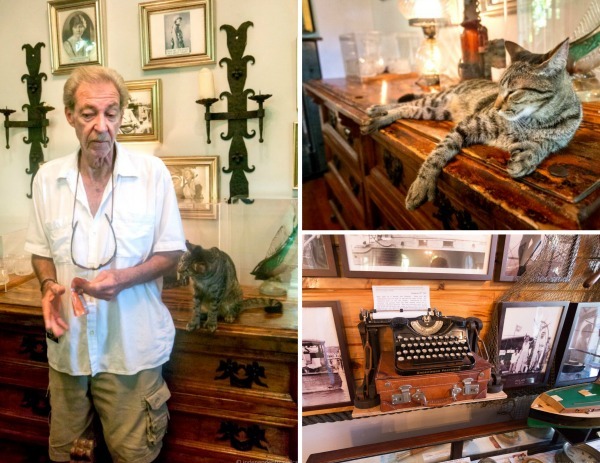 While the allure of the celebrated 20th-century American writer draws many of the visitors, a large number seem to come simply to see the cats! Outside we were able to get a bit more one-on-one time with some sleepy kitties perched on benches and wandering around the flowers. The cats are believed to be descendants of Hemingway’s own cat Snow White (or Snowball as sources differ on the cat’s name), a white domesticated cat with 6 toes! The story goes that he was given the cat by a sea captain and that cats with 6 toes were believed to be particularly lucky aboard a ship. 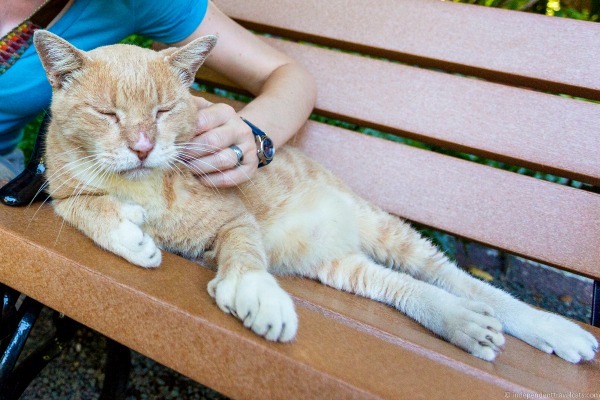 Normal cats have five front toes and four back toes, but polydactyl cats often have six toes on their front feet and sometimes extra toes on their back feet as well. 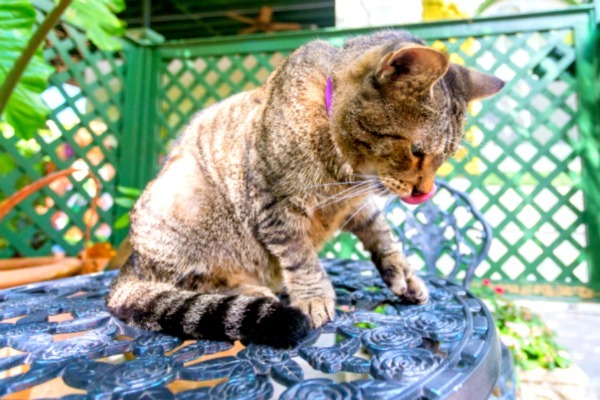 While only about half of the cats at the Hemingway home have the 6 toes, they are all believed to carry the polydactyl gene. Six-toed or five-toed they were all beautiful to watch them wandering around as if they owned the place! 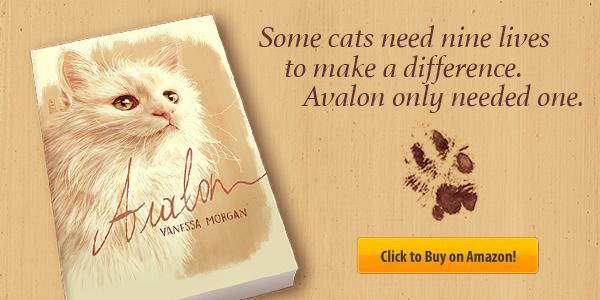 The cats are a variety of breeds, shapes, and colors. 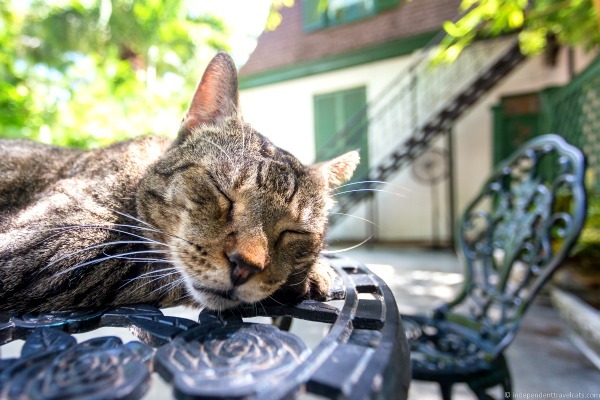 Hemingway named his cats after famous people, and so that tradition is carried on today at the Ernest Hemingway Home & Museum with the cats either carrying names of famous people (e.g., Clark Gable, Joe DiMaggio, Rudolph Valentino) or of the Hemingway family members (e.g., Martha Gellhorn, Bumby). We were a little concerned about the care of so many cats and were told that the cats are well looked after with regular screening and treatments, such as ear mite treatments, flea spraying, and worming by a veterinarian who comes to the house. The Pfizer Company has also donated medicine to the museum to be used to protect the cats from fleas, heartworms, and other parasites. The cats are also provided with areas where they can always go to be away from visitors. The cats we saw certainly looked very content and healthy. We visited on a wonderful sunny day and enjoyed both the house tour and the gardens, and especially meeting the house’s feline guardians! We definitely recommend a visit here if you visit Key West, Florida. Jessica Norah is a full-time travel blogger at Independent Travel Cats who currently lives in Edinburgh, Scotland, with her husband Laurence. 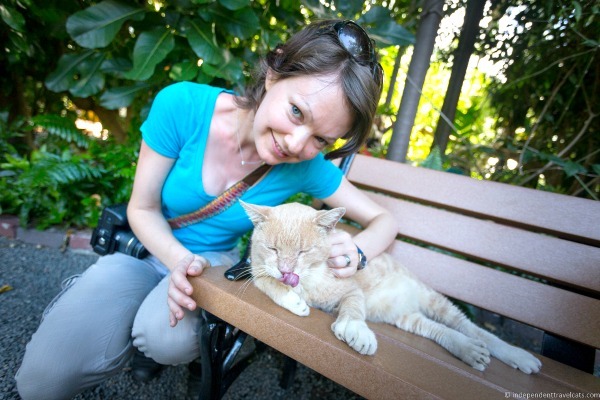 Sadly she had to leave her own two cats (Dodger and Dash) in the US when she moved to the UK, but she goes back to visit them as much as she can, and adopts kitty friends throughout her travels around the world. I would go there just to see the cats. One of my friends had a six-toed cat and there's something about them that is just a little different. It's good to hear the cats are well taken care of by a lot of sources. I've always longed to visit and more so now. Happily shared. What a wonderful place! I'll have to add it to my bucket list! There are so few places I get EXCITED about seeing ... but this has been on my list for years. Not only that ... but a few years ago, they even did weddings there. 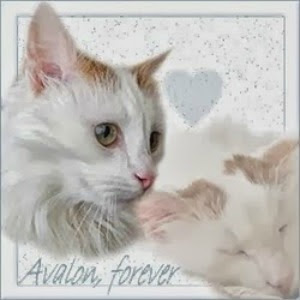 If I ever find a cat-loving partner ... it's the only destination wedding I would consider! I mean ... CATS!!! Thanks so much for sharing my guest post! 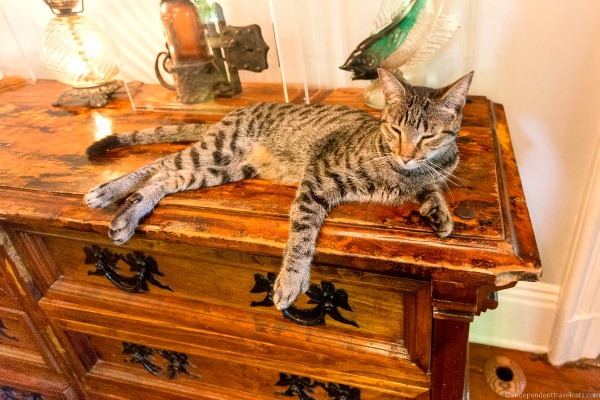 I am glad it has gotten so many people interested in visiting this very cat-friendly museum! Big, furry feet are fantastic! I'm glad they're all getting veterinary care and can find places away from the tourists. I'd love to visit this place because he was a great writer and an interesting man even though I do not like the fact that he loved hunting big game. 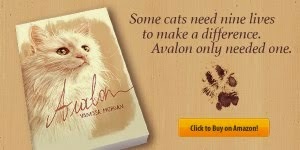 I would also love to see the cats and they do look well cared for. Aww! what lovey cute cats heheh! Such sweet kitties, I have two myself! We are sure that not only do cats add charm to house, our presence should also raise the value to the roof! That's amazing! Would love to go visit!!! Wow. Two of my favourite things together. Kitties and books. 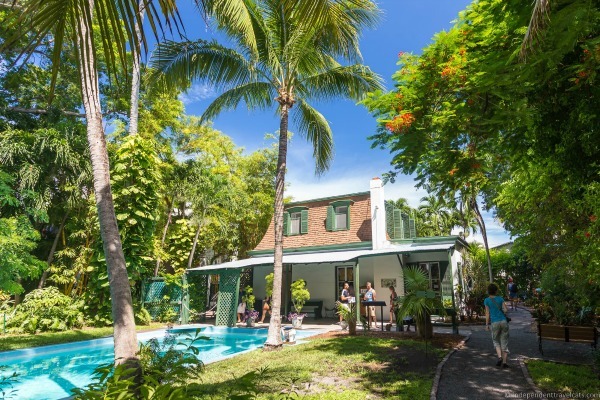 I would love to visit Hemingway's house one day. I went to the UK and visited Jane Austen's house in Chawton, such a wonderful experience. That is incredibly interesting, I wonder what Papa would have thought about it all. Love the kitty photos, I'm a sucker for a ginger kitty. 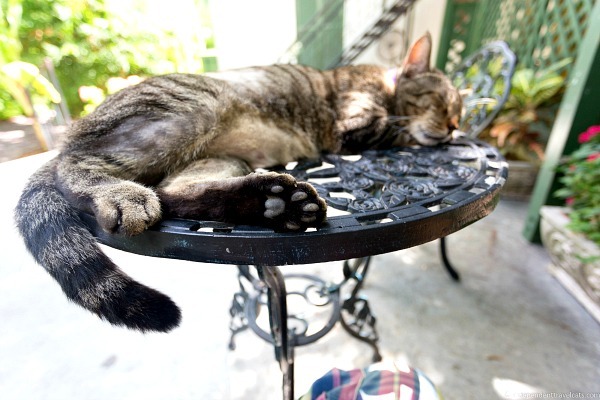 The cutie on the patio table has such adorable paws—great angle. The kitty on the chest of drawers is a beauty. I always love to see and read about Hemingway's cats. I dream of visiting there someday. Thanks for sharing such a wonderful guest post! Mumbai is the industrial capital city of India. It is the epicentre of Indian economy. Many industries are prospering in Mumbai and packers pune to bangalore is one of them. Despite the fact that the industry is dominated by unorganised players. There are so many people who want to packers pune rates from one location to another. They seek the expert services of professional movers and packers. ¿Estás cansado de usar productos para perder peso? Si nada te ha funcionado, prueba el black latte hoy. Traveling is a wonderful hobby for millions of people across the globe. This also provides various advantages to people. Here's why traveling is important. The ability to move around article shows one place to the other place is the main virtue one can ever have. All humans and animals have been secured with this ability, but humans are always a step forward. Its my great pleasure to visit your blog and to enjoy your great posts here. London to Liverpool I like it a lot. I can feel that you paid much attention for those articles, as all of them make sense and are very useful.